MEDICAL COSTS SINCE JULY 2014: $1,632.39 PLEASE CONSIDER MAKING A DONATION! Juno, aka Oshkosh Juno, is an 8-year-old white and brindle female born on May 22, 2006. Juno's sire is Kiowa Sweet Trey and her dam is Usa Isabel. Juno has 9 races on record at Greyhound-data.com at the TriState track in West Virginia, starting in August 2009 and finishing up in October 2009. She went on to whelp a litter in October 2010, sired by Oshkosh Slammer. 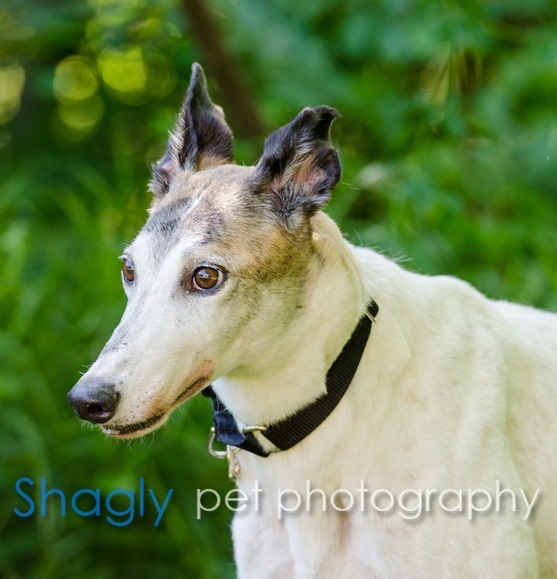 This gorgeous girl is ready for retirement into a loving forever home! Juno is not tolerant of cats at this time. Juno sustained an injury in her foster home on Monday, July 7. She is recovering from surgery. Juno's broken jaw is healed and she is once again ready to look for her forever home! Even by greyhound sweetness standards, Juno is off the charts crazy sweet. 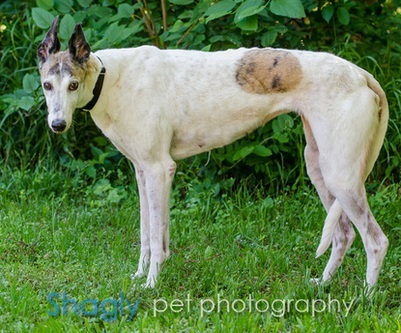 Her Majesty, Queen Juno, is full of grace and character and fun and beauty, being white with brindle patches. She is royalty, and she never fails to remind you, even as she is acting like a puppy. Royals don't always eat with the peons, so she often waits until slightly later to eat breakfast alone. She does join the riff raff for dinner, however. Having only 3 teeth, Juno's diet is mostly canned food, with a small amount of kibble. She has her own soft treats. She loves her squeaky toys, carrying one with her from room to room and even outside. She loves zoomies with the pack. She loves to go for long walks, and is the dog who slows down when she realizes we are heading home. Juno has an uncanny sense of when we are headed home. We tested this by walking past the house the other day, and sure enough, she had renewed energy! Juno rides well in car, has never had an accident in the house. When we leave, she has the run of the house. She gets along very well with the other 3 dogs in the house. When we purchased a new bolster dog bed, the Queen thanked us by claiming it as hers. She can frequently be found roaching on her back on "her" bed or any other bed, as long as she is close beside you. Juno will follow you from room to room, often remaining right by your side. Everyone who meets her falls in love with her. She finds a way into your heart in the most endearing, uncanny way. Don't be discouraged by her age. She is full of energy, life and silliness. It is not possible to exaggerate how loving this girl is!